Cinépoetry is not a singular film movement or an approach to filmmaking associated with a certain time or place. Rather, it describes various approaches to film practice that evoke the poetic in the moving image and eschew linear narrative progression, from the surrealist films of the 1920s to contemporary video art. 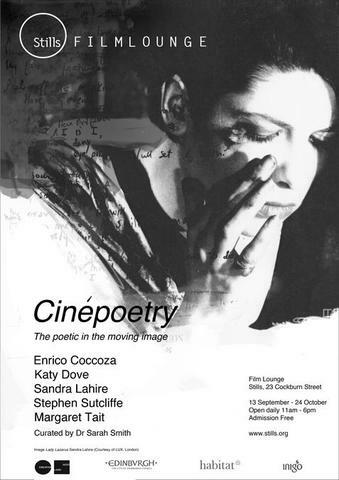 Key features of cinépoetry include the use of slow motion, superimpositions, and metaphorical and symbolic imagery. For experimental filmmaker and film theorist, Maya Deren, the film poem makes visible the invisible. It excavates the depth of a movement, producing moments of retardation that examine a feeling and therefore allow the audience greater degrees of perception over interpretation. The films selected for this programme identify the diversity of work from within British filmmaking and video art that can be described as cinépoetry. This attempt to register the poetic can take the form of an actual engagement with literature, as with Sandra Lahire’s citation of Sylvia Plath’s voice in Lady Lazarus or Stephen Sutcliffe’s borrowing of W.B Yeats poem ‘Vacillation’ in his film of the same name. Alternatively, it can focus predominantly on the imagistic, as in the balletic abstractions of Katy Dove’s Stop It, the lyrical observations of the everyday in Margaret Tait’s Ariel and the surreal imaginings of Enrico Cocozza’s suburban fantasy Masquerade. Through orchestrated layers of image and sound each of these five films provide absorbing moments that resonate long after we’ve stopped looking.